Good pinpointer but suffers the tech for tech sake syndrome, you don't need settings for depth full power is not enough in its case. And theres this stupid 360 degrees detection selling point they all brag about its hiding the fact thats a negative point not a plus point. You need all the detection in the tip so you get a directional pointer! When every bit of the shaft detects it sounds in the side of the hole even when the tip isn't seeing the target. I maybe see why you need to turn of the sound but its not really laud enough until you switch it off and it gives these awful beeps, one is plenty! The only other downside is muddy gloves pressing either switch soon fill the speaker hole with mud! The only other pin-pointer that I have ever owned was a cheap one so I cannot compare the Makro to any others but I can tell you this. 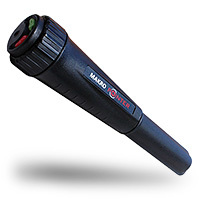 I have been using this Makro Pointer for a while now and have had zero problems. It is a well built quality product that works extremely well. What else can I say other than try one for yourself. I think you will agree! Verry good pinpointer! All I have to say.